Eastern Shore Dental Care is now accepting donations for this year’s Bubba’s Blankets fundraiser. Since 2012, Bubba’s Blankets has distributed more than 1,500 blankets to men, women, and children battling cancer. This year will be the third year we do this without the founder and our inspiration, Jimmy Myrick Jr., who passed away on February 12, 2016 after a 5-year battle with leukemia. Jimmy was also a patient at Eastern Shore Dental Care. During that battle, Jimmy still found the strength to inspire hope in others fighting cancer by distributing cozy blankets on Christmas Eve to patients at the University of Maryland Medical Center (UMMC) adult oncology floors, pediatric oncology unit, and oncology outpatient clinic and at the UPenn, Abramson Cancer Center. 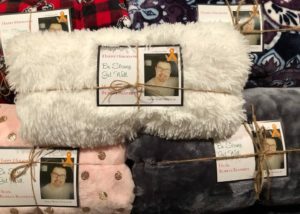 Jimmy’s elves will continue his legacy of love by collecting and distributing blankets at UMMC, UPenn and our 2017 added location, Children’s National Medical Center pediatric oncology. Eastern Shore Dental Care will be accepting blankets now through Friday, December 7, 2018. To donate a blanket to this wonderful cause, you can stop by our office and hand them to our receptionist. We’re open Monday through Thursday 7am to 7pm, Friday 7am to 4pm, and every other Saturday from 8am to 3pm.